A very poor sequel to a very good thriller, BEHIND ENEMY LINES: AXIS OF EVIL is about a small group of Navy SEALS attempting to take out a missile site in North Korea. Naturally, everything that can go wrong, does. 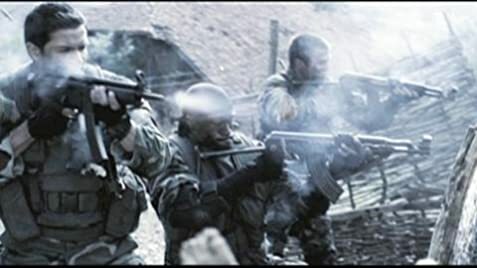 Shot on the cheap in Bulgaria, this STV is pretty much one continuous firefight, and the battles are so poorly executed that it is hard to tell what is going on a good part of the time. The acting is strictly of the cardboard variety. The film reminds me of a Chuck Norris flick from his days with Cannon, only those films were better. Some old timers pull duty here, including Keith David as a SEALS trainer and Peter Coyote as the president of the U.S. No suspense, no real interest in anything going on. Stick with the original. Chief Master Sergeant B.J. Wheeler was a consultant during the filming of the movie. Korean Officer: Army Ranger, Black Hawk Ground? Possibly with all the enlisted personnel but definitely with MCPO Boytano at the end, the insignia on his cover (hat) is showing that of an officer. He should have insignia matching that of his rank and no gold bar around the rim.